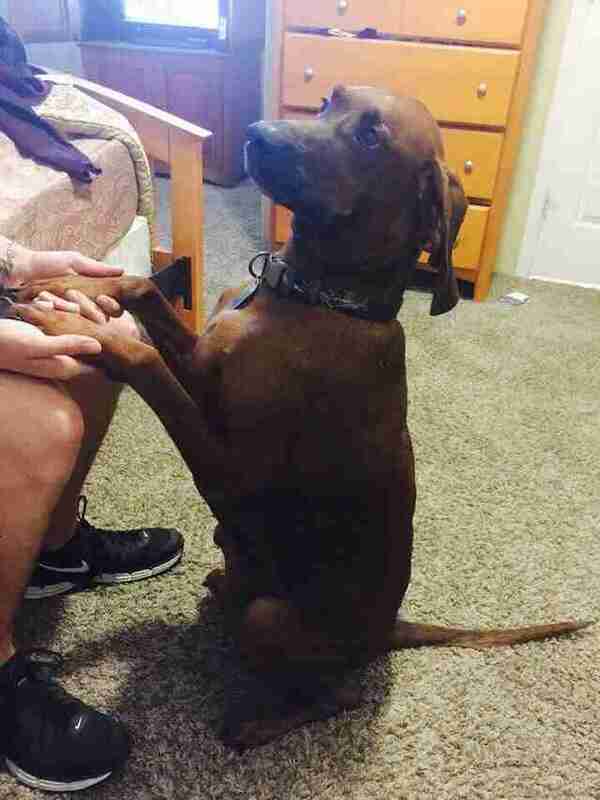 He traveled across the country by himself, but was so happy to see his family again. 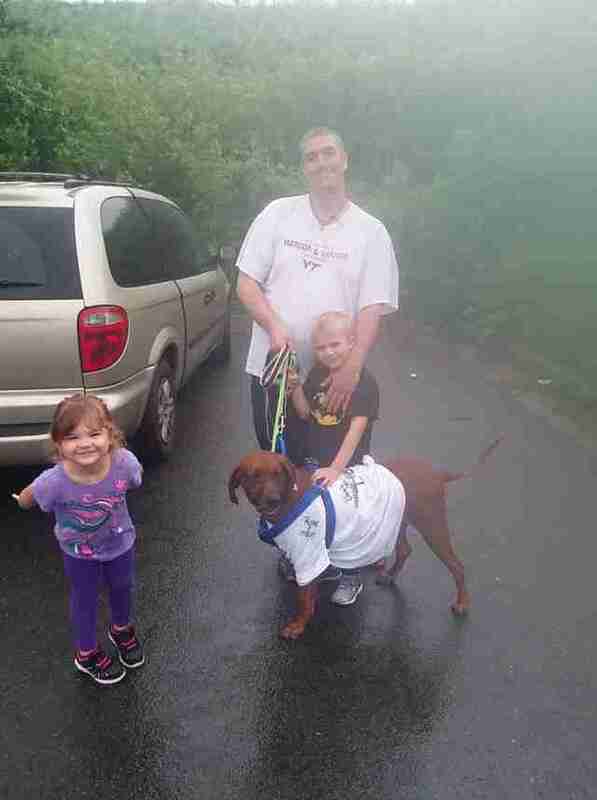 When Adam Herbaugh left his house in Roaring Spring, Pennsylvania, for a walk with his two dogs, he never could’ve predicted that he’d return with three. Strolling near the local YMCA, Herbaugh heard a jingling sound behind him and turned. 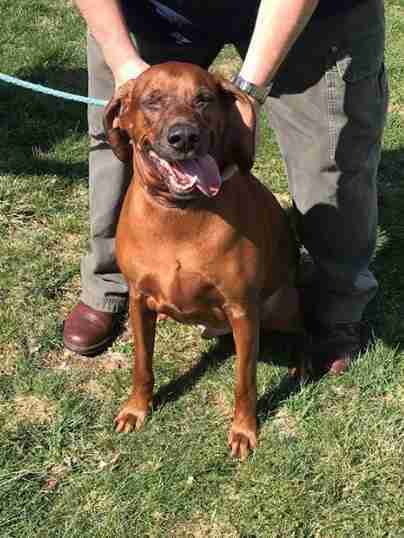 There, he spotted a large brown coonhound all alone, his collar jangling noisily with each step. Herbaugh jokingly asked the dog if he’d like to come home with him, and to his surprise, the strange dog listened. When Herbaugh reached his house, the coonhound was still right behind him. It was clear that this dog was someone’s very lost pet. Herbaugh brought the dog to Companion Animal Hospital, where staff scanned the dog for a microchip and confirmed Herbaugh's hunch. 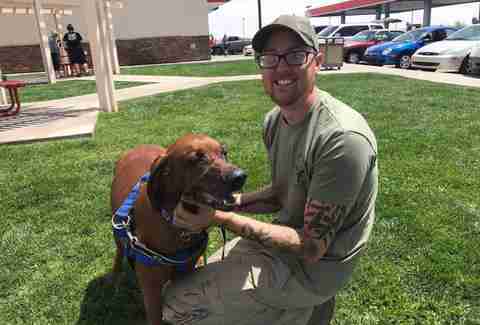 The dog, named Jake, did have a microchip — which was registered to owners in Phoenix, Arizona, over 2,000 miles away. The hospital reached out to A Darrah Bull Bully Rescue to step in and help the dog in need. 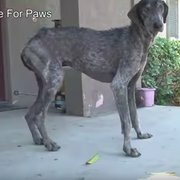 When Renae Metz, president of the rescue, heard how far the dog had come, she couldn’t believe it. “The initial reaction was complete shock,” Metz told The Dodo. Jake had been missing for nearly a year and a half after disappearing from his family’s yard, leaving his rescuers scratching their heads as to how the intrepid pup managed to cross the country all on his own. 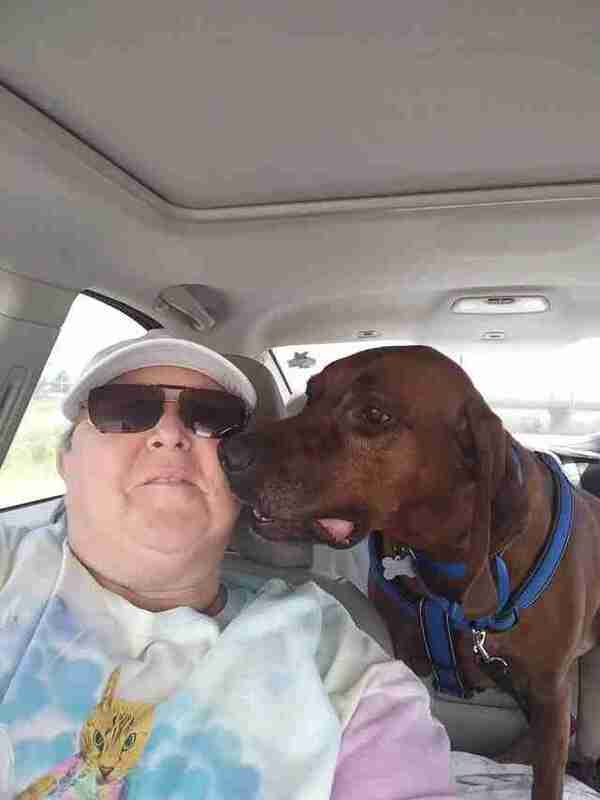 With a newborn baby at home, Jake’s owners were unable to make the long trip to fetch their wayward dog, and reached out to the rescue to see if there was any way to get him back safely. “We were happy to take on the challenge,” Metz added. Metz’s sister, a transport coordinator, plotted Jake’s epic road trip back home, scouring Facebook for qualified volunteers for each leg of the trip. Just five days after Jake was found wandering the streets, the second half of his adventure began. 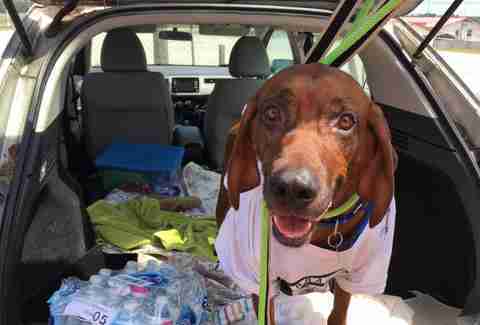 Jake donned a T-shirt reading “Arizona Or Bust” and hit the road again, this time with rescuers in tow. 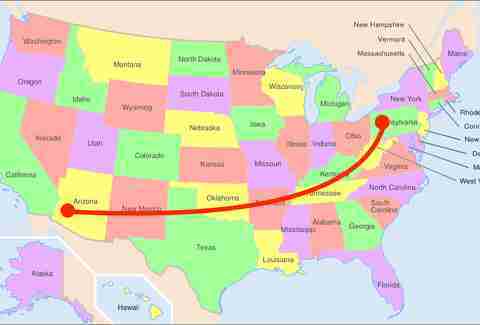 Over the next four days, Jake met new people in Tennessee, Arkansas, Oklahoma, Texas and New Mexico, until he finally reached his home state of Arizona. With each handoff, Jake’s white shirt gained a new name. 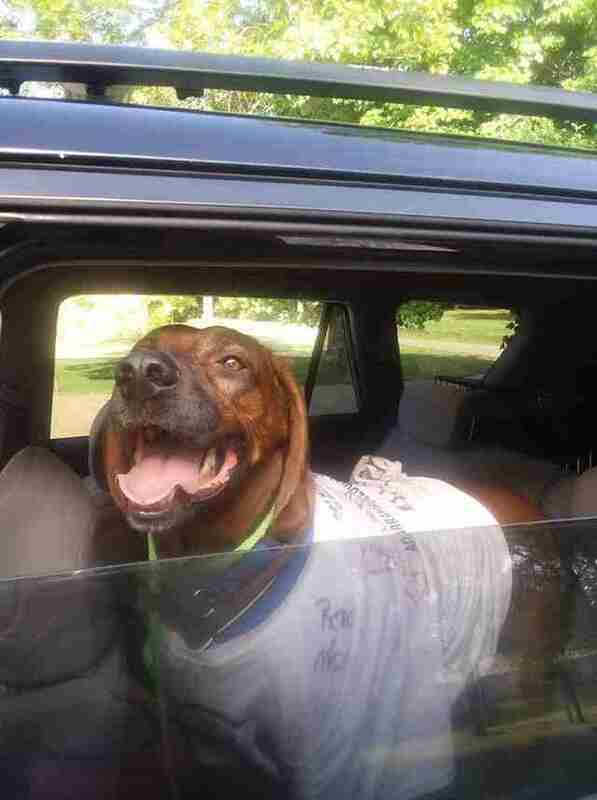 It took 30 stops, 20 drivers and three overnight stays before Jake was finally reunited with his family. When the last volunteer dropped off Jake with his dad, it was clear how much the two had missed each other. Now safely at home, Jake is adjusting to his new baby sibling, but it’s clear he won’t go wandering again. To help other lost and homeless dogs like Jake, you can make a donation to A Darrah Bull Bully Rescue.